Stunning "Tree of Life" Kashmir wool rug designed in an extremely intricate manner.in various colors. It is handmade and has taken 5-6 months to weave this gorgeous rug. - A Gorgeous Handmade rug is woven in the finest quality New Zealand wool. - This is a Tree of Life design rug and its design has been originated from Persia. - It is of fine quality and is a perfect fit as a wall hanging or as a feature rug. - It has taken about 5-6 months to weave this beautiful rug. - Main colors are rust, dark blue, sky blue, ivory and pale green. 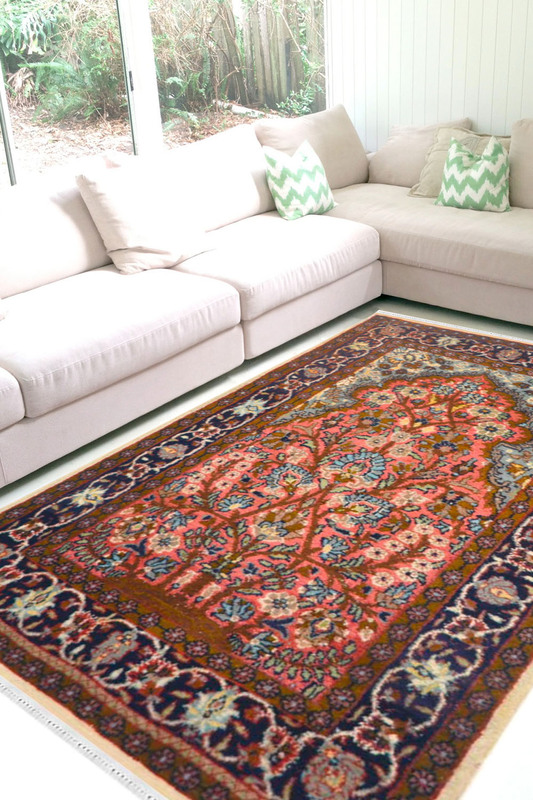 - The center of the rug has a tree of life pardah pattern and is intricately woven. - The rug has an outer peripheral and has a floral pattern and big motifs in it. This rug is of fine quality and is conducive for heavy traffic areas.